[Episcopal News Service] Since the first days of his episcopate in 2008, Diocese of Maine Bishop Stephen Lane hasn’t shied away from raising a prophetic voice in the public square. As a church leader, he has spoken publicly in newspapers and at the state legislature in support of marriage equality, common sense gun laws, state budgets that ensure protections for vulnerable families, and against hate speech and intolerance. In late 2014, however, questions like, “How do we engage Episcopalians in our congregations to get involved in advocacy?” and “How do we determine which issues to direct our focus?” led Diocesan Council to create a Public Policy Steering Group. Among the members invited to serve was John Hennessy, a parishioner at St. Luke’s Cathedral in Portland. Hennessy spent 20 years at the State House in Augusta as a lobbyist for progressive causes, and had recently returned to private consulting after five years as the policy director for Maine AARP. 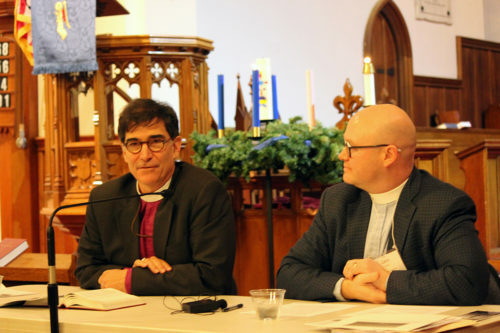 During its first and only conference call, members of the steering group decided to create a statewide network modeled on the Church’s Episcopal Public Policy Network to teach Maine Episcopalians how to advocate with local, state and national policymakers about gospel issues of poverty, homelessness, hunger, and justice for the incarcerated, immigrants and all those at the margins. Although a statewide public policy network resonated, volunteer members of the steering group and diocesan staff were already stretched too thin to make it happen. Then a chance call to the Rev. Chuck Wynder, the Episcopal Church’s officer for social justice and advocacy engagement, made all the difference. A grant program to support statewide public policy networks was included in the 2013-15 triennial budget. Since funds were still available, Wynder encouraged Hennessy to write a grant application. Suddenly, the creation of the Maine Episcopal Network for Justice seemed more like a reality. By November 2015, with assurances of a one-year grant of $30,000 and an $8,000 commitment from the Diocese of Maine, it hired Hennessy as the network’s part-time director. Over the last year, Hennessy has visited more than a dozen Maine congregations, hosted an over-subscribed training session at St. Luke’s Cathedral, conducted workshops at diocesan training events, advocated with legislators in Augusta, and supported the work of two statewide referendums: one to raise the minimum wage for Maine workers, which passed in November; and one to close background-check loopholes in gun laws, which did not. MENJ also partnered with the diocesan Compensation Committee to develop a resolution that passed at Maine’s Convention in October to raise the minimum wage for lay employees, including church child care workers, to $12 an hour in 2017. The intent is to continue to raise the minimum each year until it reaches the Living Wage standard of $15 an hour in 2020. “We’re excited about several upcoming events in the coming year,” said Hennessy. “We will join with interfaith, ecumenical, and community partners to host a two-day Advocacy Days session in March. The first day we will offer training and the second participants will visit the State House to meet with their legislators. Because we have several congregations with groups of young people interested in social justice issues, we will do church-based training for them this winter so they will only miss one day of school.” A plan to take a group of young people to Washington, D.C. to meet with members of Maine’s congressional delegation is also in the works. Hennessy made clear that Maine Episcopalians never envisioned doing this work alone. Because the dioceses of northern England share many common concerns, Lane tested the interest of the bishops of New Hampshire, Vermont, and the New England Lutheran Synod about becoming partners. The response was enthusiastic by both bishops and their staffs. Hirschfeld recounted the passage in Matthew where Jesus feeds the multitudes: “Jesus says he has compassion for the crowds. The Greek word is splagchnizomai, the same word from which we get the word spleen. Jesus feels compassion in his guts. It is an incarnate word; it moves one physically. It’s not an intellectual exercise. Compassion is something we experience suddenly when we recognize we have gone to the deepest level of humanity with somebody who is in need, somebody who is not like us. It’s out of that abundant compassion that Jesus is impelled to act, that we are impelled to act. Lane also expressed his confidence in the network as an exemplar to the wider church. “We believe this model offers the possibility of renewed participation by Episcopalians in the public square and enhances our relationships with other Christians as we seek to ‘seek and serve Christ in every person, loving our neighbors and ourselves’” he said. – Heidi Shott is canon for communication and advocacy for the Episcopal Diocese of Maine. It was wonderful to read this article and your plans to get active in policy change for Maine’s people. I have done this before on others behalf. It is one of the most important things we can do to help others. Because I had been affected by the policy in place, I did not want others to suffer like I had. I did make a difference with my bringing the issue to my local legislator. She went with me to Augusta and I read a letter I had written. It was extremely powerful for me. I hope you take witnesses to share their own experiences of being poor, hungry or opreseed etc. They need to be there with you in with their own voices. This adds passion that you cannot get across to the legislation with just a speech. The legislators need to go see the poverty and hunger. They won’t and don’t. Bring it to them with people, pictures and other types of visuals. I hope I have helped with my little expounding! As you can tell, I am still charged from my visit to Augusta and that was 20 years ago!! !